Augusta Tomorrow | Sibley Mill is Being Redeveloped! Sibley Mill is Being Redeveloped! 05 May 2016 Sibley Mill is Being Redeveloped! It was the subject of hushed conversation for months: Two South African businessmen with a bold plan to turn a 19th century textile mill near downtown Augusta into a 21st century technology park. By Wednesday afternoon, there was no longer any need to whisper. 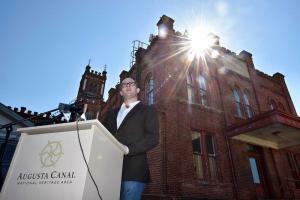 The two entrepreneurs – partners in a venture called Cape Augusta Digital Properties LLC – publicly announced their intent to redevelop the historic Sibley Mill property into a 10-megawatt data center and technology park through a long-term lease with the Augusta Canal Authority, the owner of the 136-year-old property. Cape Augusta CEO James Ainslie said during a news conference at the long-idled facility that the planned $90 million to $150 million development, known as Augusta Cyber Works, would support cyber-related businesses and education facilities and help anchor the region’s burgeoning tech industry in the city’s urban core. “I see a number of organizations moving in different directions around cyber, and what I hope this does is create a special context for collaboration to occur,” said Ainslie, a data center developer and former head of Johannesburg-based Cloudseed. Ainslie and Cape Augusta Chairman Wayne Millar, a fellow South African whose local ventures include the Champions Retreat Golf Club at Riverwood Plantation in Evans, pitched the data center concept to canal authority officials in late 2014. Data centers house massive amounts of computer equipment and provide power and storage capabilities for the information technology industry’s growing “cloud”-based systems. Ainslie said the $250 billion cloud industry is projected to exceed $500 billion in a decade. “Data centers are a fundamental commodity that underpin the entire cloud services industry in the United States,” he said. He said Sibley’s canal-side location and built-in 2.5-megawatt hydroelectric turbines provide the two things a data center needs most: electricity to power its servers and water to keep them from overheating. The property also is eligible for historic-redevelopment and community-renewal tax credits that could cover up to $20 million of the multiphase project’s cost. The canal authority has owned the 600,000-square-foot former denim plant since 2010, four years after it was shuttered by Alabama-based Avondale Mills. The authority approved Cape Augusta’s 75-year lease on the facility April 25. Authority Executive Director Dayton Sherrouse said the length of the lease gives Cape Augusta the “ownership” equivalent required for federal tax credit eligibility. He said Cape Augusta’s rent payments are deferred until year five, when its data center should be fully built out. The canal authority also owns the adjacent King Mill, which is currently occupied by Standard Textile. It has granted Cape Augusta the rights to expand its development to that 600,000-square-foot property as Standard’s operation comes to a close. A $1.3 million environmental cleanup at Sibley began in 2011 and is expected to be completed within the next several months, Sherrouse said. The cleanup was funded by federal grants and revenue from the facility’s hydroelectric power generation. Cape Augusta expects to sublease portions of the redeveloped mill and surrounding campus to “technology companies, data center users and operators, integrators and cyber-educators.” Ainslie said the company plans to announce its first tenant later this month at an event that will double as a groundbreaking ceremony for phase one of the project. Earlier this year Cape Augusta filed site plans with Richmond County to renovate more than 36,000 square feet into office space. Ainslie said the yet-to-be-disclosed tenant could move in by November. Sherrouse said the canal authority envisions the Augusta Cyber Works campus supporting ongoing cyber-related activities in the area such as Fort Gordon’s Cyber Command Center and the cyber-educational activities recently announced by Augusta University. “It is our hope that the Augusta Canal will once again be the hub of innovation and economic revitalization for our community well into its third century,” he said.